Since I was young, I have been interested in different cultures. My parents bought a set of picture encyclopedias that included cultural information. The encyclopedias were arranged by subject, such as “holidays” and “foods.” These books widened my horizons and provided me with access to the different ways in which people live. First of all, it’s interesting to learn about those who are different from you. There’s nothing wrong with doing something just because it’s interesting. A little extra knowledge ever hurt anyone, and it’s probably more useful and edifying than watching another mindless TV show. It stimulates the mind, and forces you to think in new ways. 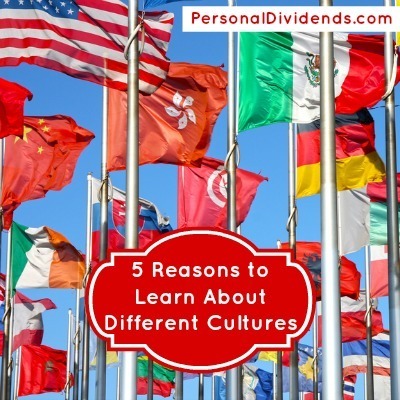 Learning about other cultures is an interesting way to challenge your thought processes and expand the way you process information. Make it a point to learn more about other cultures and you will find that your propensity to keep learning helps you grow your mental capacities. Many of the problems we have in this world are due to misunderstandings. When you learn about another culture, and see why others do the things they do, it’s easier to understand them. You can develop sympathy with others. It’s harder to justify things like hatred and war when you understand where another person is coming from. It’s true that cultural heritage shouldn’t be used as an excuse to oppress others. There are times when traditions do need to be discarded. However, it might actually be some of the trappings of your own culture that need shedding. When you learn about other cultures, you learn that there is more than one approach to life. You also learn that your approach might not always be the best way. Perhaps the cultural heritage of someone else can add another dimension to your life. Learning about other cultures allows you to move outside your own bubble, and find new ways of thinking, and new ways of approaching problems. With technology making the world ever-smaller, and with the ease of travel between countries, chances are that you will meet someone with a different cultural heritage at some point. Being able to tolerate others, and not berate them because of their differences is not only a big part of living in a global community, but it is also the mark of a well-rounded person. If you want to be able to mix more when you travel, and when you encounter others in your own country, it makes sense to learn about other cultures so that you avoid faux pas. Take the trouble to learn about other cultures and customs, and you’ll have a richer experience no matter where you go.